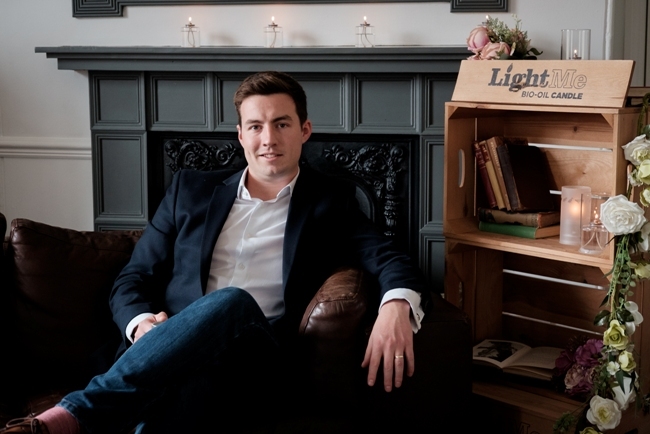 Entrepreneur Lewis Bowen has launched a £300,000 crowd-funding campaign to grow his LightMe brand of candles and fragrances. Bowen launched his business, Air Global, upon graduating from Sheffield Hallam University six years ago. His idea was a response to the millions of deaths that occur each year from indoor air pollution caused by traditional fuels. LightMe, the company’s best-known product, is a bio-oil candle refined from a renewable source of palm kernel oil. It burns more cleanly than traditional candles and extinguishes when knocked over. Bowen plans to raise £300,000 on the Crowdcube platform, offering investors a share in a 20 per cent equity stake. Upon reaching his target, he intends to invest in his sales team to build the range of stockists for LightMe. Lewis said: “We are ambitious and we want to take the business to the next level. The LightMe range is targeted at the retail and catering industries. It is designed to be sold as a home accessory or table decoration. The business is backed by a heavyweight team of directors including experienced businessman and investor Chris Welsh, drinks industry veteran Chris Bowen, venture capital expert Emma Cross and former Compass Group UK & Ireland managing director Ian Sarson. Lewis added: “We have spent a lot of time developing these products and believe we have a fantastic range that will appeal to consumers. That work is already paying off in terms of conversations with big name retailers. After 12 months of development, Air Global now requires funding to drive a new and existing range nationally and internationally.